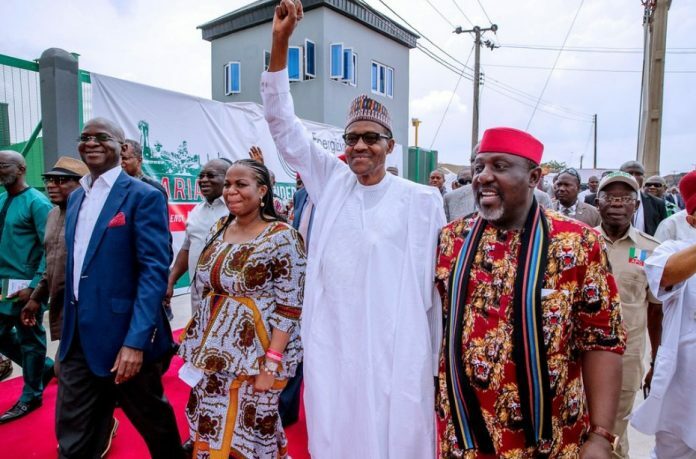 The Nigerian presidency has said the president, Muhammadu Buhari, did not expressly ask voters in Imo state to vote for the All Progressives Congress (APC) because of the “mixed crowd” that attended his rally. There were mixed reactions on Wednesday after Mr Buhari told the people of Imo State to vote according to their conscience. Although the Imo State governor, Rochas Okorocha, is a member of the APC, he is supporting his son in law, Uche Nwosu of the Action Alliance (AA), to succeed him in office. The crowd that welcomed Mr Buhari, therefore, comprised of supporters of both the APC and AA. The presidency on Wednesday said Mr Buhari has assured members of the APC that he is fully behind the party and its candidates in every state of the federation, and campaigning for them wherever he goes. Speaking to journalists after the rally in Owerri, Imo State, the presidential spokesperson, Garba Shehu, dismissed insinuations that Mr Buhari did not show full support for the APC while campaigning in the state which has made headlines recently. Mr Okorocha is engulfed in a bitter battle with his party; the party’s earlier announcement of the governor’s sack from their fold was swiftly overturned by the national leadership. Despite his differences with the APC, Mr Okorocha remains a member and is campaigning vigorously for Mr Buhari. “The massive crowd that gathered to welcome President Buhari in Imo State was made up of not only supporters of the APC in the state, but also supporters of other parties who are united by their love for the President and their desire to see him re-elected, despite the local candidates they support,” Mr Shehu said in a statement signed by head of information at the Presidential Villa, Atta Esa. He explained that Mr Buhari’s consciousness of this “obviously-mixed crowd” was the reason why he did not speak only about support for the APC during the campaign, but also encouraged the people to vote according to their consciences. Mr Shehu said Mr Buhari’s open endorsement of Hope Uzodinma, the APC gubernatorial candidate in Imo State, is confirmed after the President raised the Senator’s hand high before the crowd at the campaign rally. “President Buhari is for the APC in every state and there is no doubt about that, despite his immense cross-party support,” he said.